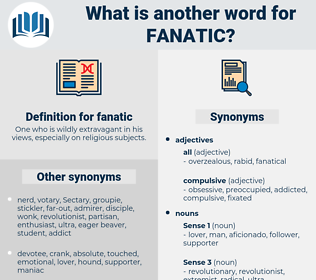 What is another word for fanatic? One who is wildly extravagant in his views, especially on religious subjects. orthodox, liberal, passionless, conservative, traditional, progressive, conventional. He sat down to eat, but when his meal was half finished, there came bursting out of his soul a flame of emotion, and he put down his food, turned half around from the table, grasped the edges of the board with both hands and cried as a fanatic who sees a vision: Oh, those men, - those men - those wonderful, beautiful souls of men I saw! 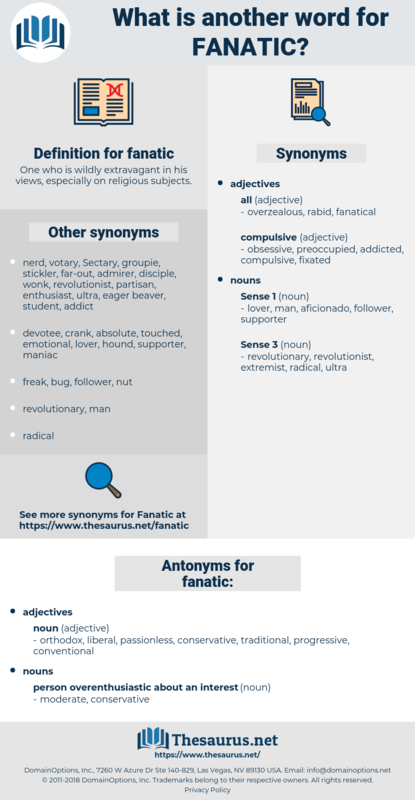 fantods, fantasy, fundus, fuentes, Finnan Haddock, Fiendish, fantasize, fumed oak, funds, fantasise, fantasia.